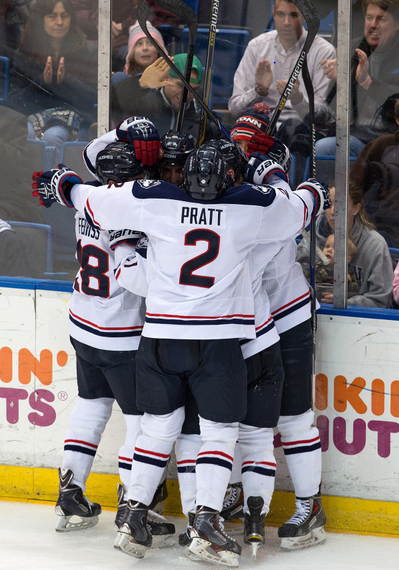 The UConn Men’s Ice Hockey team just recently finished their Hockey East Inaugural season, and exceeded dismal expectations to become a team to be reckoned with. Everything was against them but they still did great for a first year Hockey East team. They made the jump to Hockey East, the best college hockey league in the nation, from Atlantic Hockey, a much lower league by comparison. They moved to a new off-campus arena, the gigantic XL Center, from their old on-campus arena, the Mark Edward Freitas Ice Forum, where small crowds attended games, but the Huskies made it a tough arena to play at no less and it was where they were comfortable. But they adapted quickly, becoming a “giant killer” in Hockey East and quickly making the XL Center a tough venue to play at, only losing there three times all season, and by surprisingly attracting large crowds, making them lead Hockey East in attendance. Yes, the results of this year were surprising. 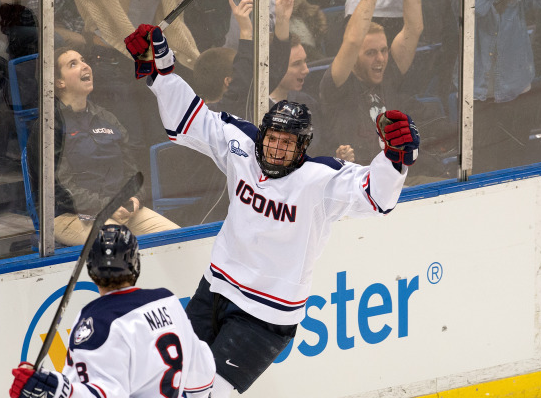 That aside, in this post, I will recap UConn Hockey’s games in February as well as their playoff games, which encompassed some of UConn’s most exciting games. UConn’s first game of the month was against the Maine Black Bears at home at the XL Center, the second game of a home-and-home series. 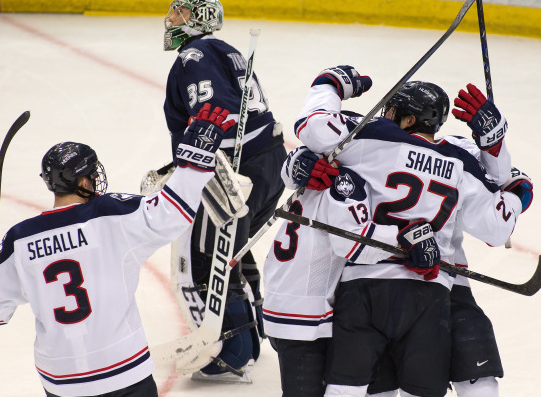 I covered this game though in my post A Recap Of The Month Of January In UConn Hockey. All my faithful blog readers know then that UConn battled back from a 2-0 second period deficit to force a 2-2 tie in front of a crowd of 5211 fans on Super Bowl Sunday. Their second game of the month was against the #13 Providence Friars, and the Huskies were hosting them at home at the XL Center on a Wednesday night. Despite it being a cold, windy weeknight, 4672 fans still showed up at the game. The Huskies didn’t waste much time getting a lead, as just 2:08 into the game, the Huskies got the game’s first goal. Jeff Wight won a puck battle along the boards and fed a pass to Evan Richardson who then fed the puck back to Wight who sent a cross-ice pass to Brent Norris who sent a wrist-shot on goal to give the Huskies the 1-0 lead. The Friars answered a few minutes later on the power play at the 9:36 mark of the first period. Friar Brooks Behling picked up a loose rebound in front a whipped it home past Rob Nichols, to knot the game up, 1-1. Despite the tied score through one period, UConn out-shot Providence 12-5 and maintained puck possession in the period. The Huskies wasted no time retaking the lead, scoring just 37 seconds into the second period. Evan Richardson fired the puck on goal and Trevor Gerling poked the puck by Providence netminder Jon Gillies to make it 2-1 Huskies. Unfortunately, Providence would tie it up again just over four minutes later, with another power-play goal. Ryan Segella was called for high-sticking only seconds before captain Ryan Tyson was called for delay of game resulting in a 5-on-3, and Providence’s Ross Mauremann buried a wrist shot off a rebound to tie the game, 2-2. The second period was owned by Providence, unlike the first period, as they out-shot UConn 16-7. The third period, unlike the first two periods, was fairly equal. Providence barely led the Huskies in shots 9-6, but neither team could find the back of the net. The Huskies almost did when Evan Richardson and Jeff Wight broke out on a 2-on-1 breakaway, and Richardson passed the puck up to Wight who had an open side but Jon Gillies dove across the goal and got a stick on it to send the puck wide. The game would then go to overtime, the third straight game that went to overtime for the Huskies, and ninth of the season. The Friars greatly controlled play out-shooting UConn 5-0 in the overtime session, but Rob Nichols came up big to earn the tie. It was UConn’s seventh tie of the season, which was tied with AIC for most ties in the nation, and third tie at home at the XL Center. Rob Nichols had 33 saves on the night, while Evan Richardson had two assists for his first career multi-point game. Four days later, the Huskies played the Friars again, except this time the game was at Providence. For the Huskies, this game was a disaster. Providence set the tone for the game right away, out-shooting the Huskies 6-0 in the first three minutes of play. They then scored the games first goal soon after. At the 5:03 mark of the first period, Ross Mauermann took a pass from Brian Pinho and scored on the wrap-around at the left post. It looked like the Huskies would escape the period with no further damage, but in the late minutes of the period, the game took an embarrassing and ugly turn for the Huskies. During a power-play, a wide shot by the Huskies allowed a Friars breakout, but Nichols blocked the shot and covered up the puck. Providence then won the following faceoff, and Friar player Steven McParland took the puck, and walked in on Nichols and scored the shorthanded goal to make it 2-0, at the 18:40 mark of the first. The Friars made things even worse, when they scored a second shorthanded goal on the same Husky power-play. Providence cleared the puck to Noel Accciari on the right boards and streaked in and snapped a wrist shot by Rob Nichols to make it 3-0. UConn retreated into the intermission down 3-0, sorely being outplayed and being out-shot in the period, 16-7. The second period made things even worse for the Huskies. Friar Nick Sarancino scored back-to-back goals in the first three minutes of the period. First Sarancino scored on a wrap-around at 1:11, and then scored again at 2:48 off a rebound on a power-play, to make it 5-0 Providence. 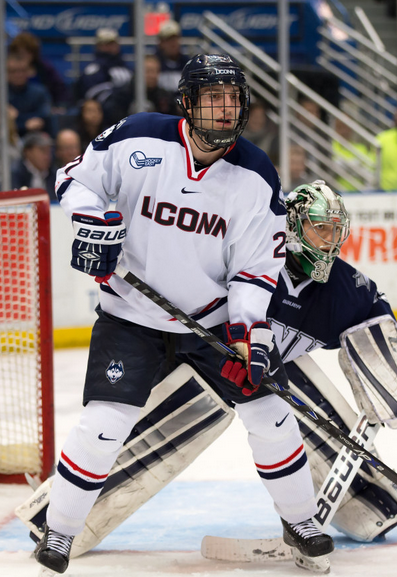 UConn then used a timeout to pull Rob Nichols and put in senior netminder Tom Communale. The Friars then got three more goals from players Mark Adams, Brian Pinho, and Kevin Rooney to make it 8-0 heading into the third period. The Friars then opened the third with a 5-on-3, and just 1:07 into the period, Friar Nick Sarancino scored off a rebound for his third of the game for a hat trick, to make it 9-0. The Huskies finally got a goal, despite it being meaningless, when Evan Richardson buried a cross-ice feed from Brent Norris top-shelf. Providence erased the goal when just 40 seconds later, they tacked on one last goal, from Friar player Brandon Tanev, to make the final score 10-1. Rob Nichols made 15 saves and Tom Communale made 18 in relief. The 10 goal were the most allowed by the Huskies since the 2002-2003 season. The win gave the Friars three of four points out of the home-and-home series. 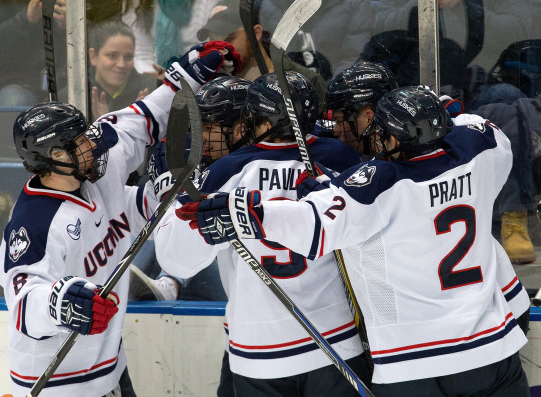 Three days later, the Huskies looked to rebound from their huge loss when they took on Merrimack at home at the XL Center in a huge conference match-up. The game had been rescheduled from January 27th due to a blizzard. 4194 fans showed up to watch to the game. The first period was fast-paced and exciting, but it ended scoreless. The Huskies had three power-plays in the period and generated six shots on the man-advantage but failed to score despite some great chances, particularly a pair of great chances from Spencer Naas. Merrimack led in shots 12-11 in the period. The second period was where UConn put the offensive pressure on, as they out-shot Merrimack in the period 15-9. Trevor Gerling created a pair of great chances that were unfortunately both stopped. First he got on the breakaway but was stopped by Merrimack goalie Rasmus Tirronen on the doorstep and then later in the period sent a pass in front to Patrick Kirtland from behind the net, but this attempt too was denied. As a result, the game headed into the third period still tied 0-0. In the third play was more even with Merrimack holding a slim 11-10 lead in shots in the period. But it would be the Huskies to finally break through. Corey Ronan beat his man in the neutral zone to enter the Merrimack zone creating an odd-man rush for the Huskies. Ronan passed to Brent Norris who was covered by two defensemen, but Norris got off a beautiful backhand pass as he was taken down by a Merrimack player to Spencer Naas who buried it by Tirronen to make it 1-0. For the final 1:48 of the game, Merrimack had Tirronen pulled for the extra-attacker, but Merrimack managed only one shot, which Nichols saved, so UConn won, 1-0. 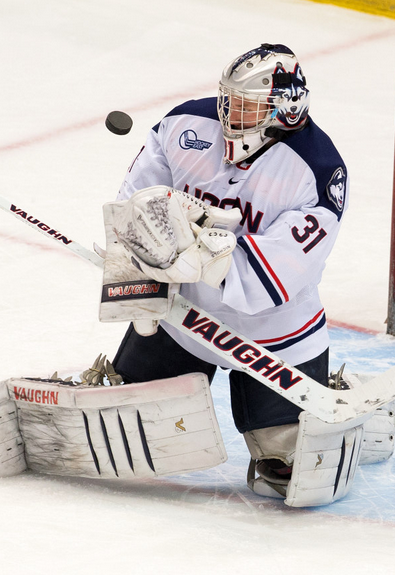 UConn led the shot category for the game 36-32; Nichols made all 32 saves for his third shutout of the season, and fifth of his career, tying Garrett Bartus for the all-time program lead in shutouts. Spencer Naas scored his 12th goal of the season, and it served as his fifth game-winner of the year as well. 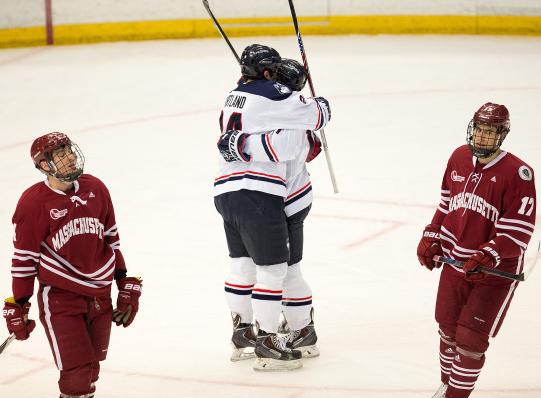 The win put UConn four points of Merrimack and kept them in eighth place. Three days later, the Huskies traveled to Boston to play the Northeastern Huskies in a Hockey East road game. For the second game in their last three, things went terribly for the Huskies. Just 2:48 into the first period Northeastern got their first goal, as Husky player Zach Aston-Reese, who was positioned in front of the net, deflected home a Colton Saucerman shot on the power-play for a 1-0 lead. Zach Aston-Reese gave Northeastern an extended lead, as he scored again at 10:38 to make it 2-0. Just two minutes later, Garrett Cokerill scored on a one-timer past Rob Nichols from the right-circle to make it 3-0, and then just over four minutes later Kevin Roy scored on the power-play on a wrist shot from the left circle, to make it 4-0. Things really got ugly for UConn when Northeastern made it 5-0 when the game was still in the first period. Northeastern cleared the puck out of their zone on a UConn power-play, and pressured Nichols when he came out to get, creating a turnover behind the net, Torin Snydeman fed a pass to Mike Szmatula in front of the net who put it in the empty net. In the closing seconds UConn appeared to finally get a goal but insult was added to injury as a Cody Sharib goal was waved off for a hand pass. Northeastern out-shot UConn 13-9 in the first and took a five goal lead into the first intermission. Northeastern picked up right where they left off tacking on two more goals in the second period. Zach Aston-Reese scored his third goal of the night for his first career hat trick, when on a 4-on-2, Colton Saucerman fed a pass from the left wing back to Aston-Reese who fired a shot past a screened Nichols for the 6-0 lead. Kevin Roy then added his second of the night by deflecting a pass from Dalen Hedges in front for the 7-0 lead with only 18.9 seconds left in the period. The third period was no different. At 4:50 of the period, Kevin Roy got a hat trick of his own by cleaning up a loose puck rebound at the right post. Then at 12:16 of the period, Kevin Roy got a fourth goal to put the Huskies up 9-0, the score they would win by. Nichols made 22 saves in the huge loss. UConn was outshot in the game 31-27. 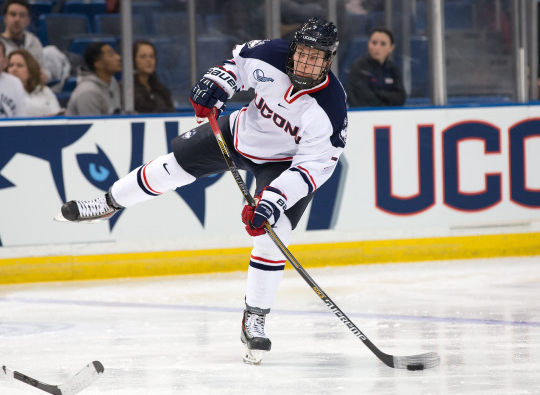 The next day the Huskies finished the weekend series with Northeastern as they hosted their counterpart Huskies at the XL Center for an afternoon matinee game. The game was played in front of a crowd of 5086 fans. Northeastern picked up right where they had left off getting the games first goal at 9:05 of the first, as Trevor Owens buried a pass right in front of the net to make it 1-0. Besides that goal the first period was very quiet, with only a few shots on goal from either team, seen in the fact that Northeastern led in shots in the period 6-4. In the second Northeastern scored again just 2:45 into the period. Rob Nichols made a nice kick-save on a shot from Zach Aston-Reese, but the rebound found the stick of Torin Snydeman who buried it to make it 2-0. But just 2:03 later, UConn got some momentum with their first goal of the game and the weekend series. Shawn Pauly had been called for a penalty, but when he came out of the penalty box he jumped into the play and recieved a pass from Corey Ronan and buried his shot top-shelf to cut the deficit to 2-1. UConn then had some great scoring chances and a pair of power-play chances, but came up empty on their chances. But just as the Huskies had gotten some momentum, Northeastern added a pair of goals to put the Huskies in a big deficit again. Kevin Roy won a puck battle on the boards, and McMurty sent a pass to Dalen Hedges who scored on a shot at the left post to make it 3-1 at 15:21 of the second period. Then at 17:33 of the period, Adam Reid scored off a 3-on-2 rush, tapping in a pass from Collier. The second period thus ended with Northeastern up 4-1; Northeastern led in shots in the period, 11-10. In the third, Northeastern tacked on two more goals. Adam Reid scored his second of the night to make it 5-1 just 3:11 into the third, and Torin Snydeman scored his second at 18:49 of the third to make the final score 6-1. UConn out-shot Northeastern in the third 17-14; for the game, both teams had 31 shots. Rob Nichols made 25 saves in the loss. The game also marked the seventh straight game UConn had failed to score on the power-play, a span of 28 power-plays in which they failed to score. 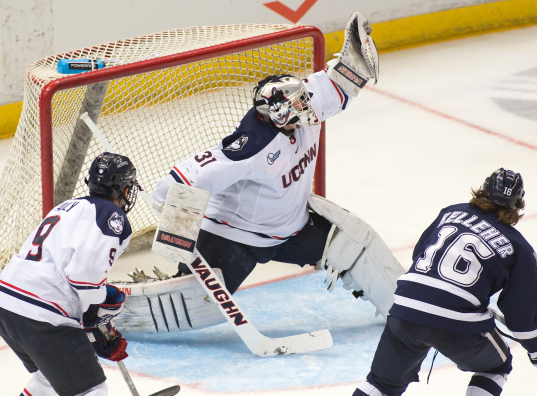 The next game was also home, as the Huskies hosted the New Hampshire Wildcats at the XL Center to begin a huge Hockey East conference series. The environment was great for the Huskies with it being “White Out the XL Center” night, which saw a sold-out, towel-waving student section, and a large crowd. In fact, the crowd of 6877 was the third-largest crowd of the season, and also the third-largest in program history; it also marked the fourth time this season that the Huskies had sold-out all of the bottom sections at the XL Center. The Huskies came out flying to start having some great chances, but failing to convert on them. Two of their best chances were Trevor Gerling hitting the post just four minutes in and Patrick Kirtland narrowly missing scoring off a rebound. Despite this, they were out-shot by the Wildcats in the first period 7-6. In contrast to the first period, it was the Wildcats who came out flying to start the period scoring on their first two shots. Wildcat Tyler Kelleher took a pass from Dan Correale and buried his shot top right corner just 1:44 into the period. Just 37 seconds later, Brett Pesce also collected a pass from Correale just inside the right circle and fired a shot off the post and in to make it 2-0 New Hampshire. But the Huskies would not go without responding. With one second remaining on a power-play, Trevor Gerling held the puck at the right post and flicked a pass to Cody Sharib in front who buried to cut the deficit in half, 2-1. The power-play goal ended a streak of 28 power-plays on which the Huskies came up empty. The score remained 2-1 at the end of the second period. UConn and New Hampshire both had eight shots in the period. The Huskies tried to find the tying goal in the third but instead New Hampshire tacked on an insurance goal at 11:48 of the period. Kelleher carried the puck into the zone and then dropped a pass to Correale who snapped a wrist shot through traffic by Nichols stick-side to make it 3-1 UNH. UConn pulled Nichols with just over a minute remaining in the game but the Wildcats got a goal, as Dan Willows tacked on an empty-net goal with five seconds left, to hand the Huskies a 4-1 loss. UConn was out-shot in the third period 13-7; the Huskies were out-shot for the game 28-21. Rob Nichols made 24 saves in the loss; Cody Sharib tallied his sixth goal of the year. 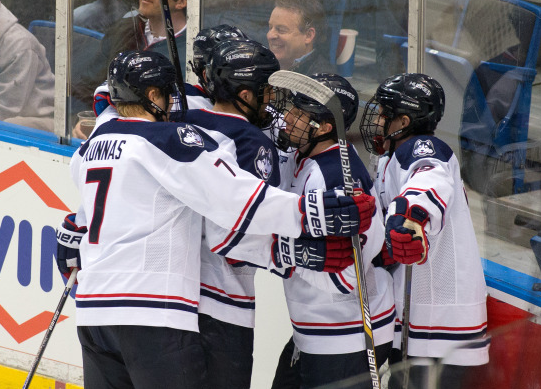 The next day, the Huskies took on New Hampshire once more to close out their season series and weekend series with the Wildcats, in Durham, New Hampshire at the Wildcat’s home, the Whittemore Center. The game was televised live on NESN and it was the first time a UConn Hockey game had been televised on this channel. New Hampshire came out firing, putting plenty of offensive pressure on the Huskies, which paid off at the 6:18 mark of the first. Wildcat John Furgele got a shot on goal that was blocked by Rob Nichols, but the Huskies failed to clear the zone, and the puck went into the right corner. Warren Foegele collected the puck and fed a pass to Jay Camper who buried a one-time shot to make it 1-0 UNH. The score would remain the same at the end of the period; New Hampshire out-shot UConn in the first, 18-10. Things continued to go in the the Wildcat’s favor, as at the 9:12 mark of the second period, Tyler Kelleher snuck home a goal before a scrum piled on Nichols, to make it 2-0 New Hampshire. The momentum continued to stay in the Wildcat’s favor but the Huskies stole some back when they finally scored at the 17:13 mark of the second period. Trevor Gerling saw his shot missed wide at the right-post, but stayed in the play and banged home a rebound off a Patrick Kirtland shot, to make it 2-1. Unfortunately, the Wildcats were very quick to respond, scoring just 42 seconds later to erase the Huskies’ goal and notch the lead back up to a two-goal margin. Matt Willows carried the puck into the Huskies’ zone and passed to Matias Cleland at the left circle who buried a wrist shot top-right corner to put UNH up 3-1, and give them a two-goal lead heading into the third period. New Hampshire out-shot UConn in the second 13-8. UConn tried to rally but New Hampshire ended all hopes for the Huskies by scoring back-to-back goals just minutes apart early in the third to put the game away. Matt Willows scored off a shot from the right circle that found its way through traffic to make it 4-1 at the 4:58 mark of the third. At the 8:10 mark, Matt Willows scored again, taking a feed from Grayson Downing behind the net and sent a slap-shot by Nichols in front to make it 5-1, which would be the final score. New Hampshire out-shot UConn in third 13-7, and 44-25 for the game. Nichols made 40 stops on the night; Gerling’s goal was his 10th of the season. 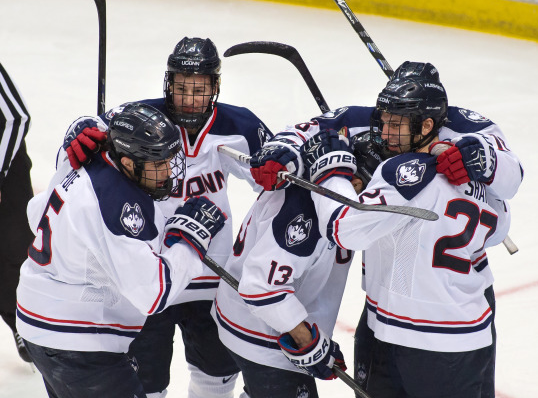 The Huskies were back in action six days later as on Friday, February 27, as they played host to the UMass Minutemen at the XL Center for the regular season finale and senior night. 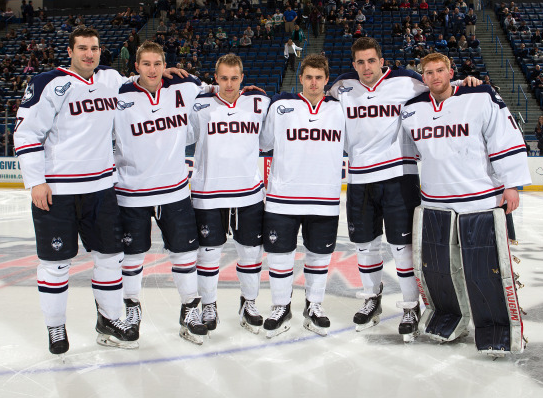 As a result, the Huskies’ six seniors, Captain Ryan Tyson, Jacob Poe, Trevor Gerling, Brad Smith, Cody Sharib, and goaltender Tom Communale, were honored in a pre-game ceremony. 6298 fans attended the game. Fittingly, the game itself saw that the seniors last home game was a one to remember. For the first time in four games, the Huskies scored first, taking an early lead. Trevor Gerling carried the puck up the right side through the neutral zone and fed Shawn Pauly who burst around the defenders to come in on a slight breakaway, deked around Steve Mastalerz stick-side to make it 1-0 Huskies at 8:38. Not even five minutes later, the Huskies extended their lead with a Patrick Kirtland goal at 13:33 of the first period. Corey Ronan created a turnover behind the UMass net and chipped a pass to Patrick Kirtland in front who let a wrist-shot rip by Mastalerz to make it 2-0. It was Kirtland’s fourth goal of the year, and it ended a 17-game scoreless drought for him. The score would stay 2-0 at the end of one period, with the Huskies leading in shots 13-3. The Huskies continued where they left off, with steady offensive pressure in the second period that resulted in a goal. Trevor Gerling sped up the right wing and threw a back-hand shot on goal that beat Mastalerz at the right post to make it 3-0 Huskies at the 6:49 mark of the second. The goal was Gerling’s 11th on the season; Spencer Naas earned an assist on the goal. After the goal, Mastalerz was replaced by back-up goaltender Henry Dill. Despite all this, UMass actually out-shot the Huskies 11-9 in the period. The Huskies continued with their great offense as they got a fourth goal midway through the third period. Joey Ferriss sent a nice pass to Cody Sharib who rushed to the net and slid the puck past Dill to make it 4-0 Huskies at 9:48 of the period. The final score would be 4-0 as Rob Nichols got his fourth shutout of the season and sixth of his career making all 29 saves, which broke Garrett Bartus’ career shutout record. 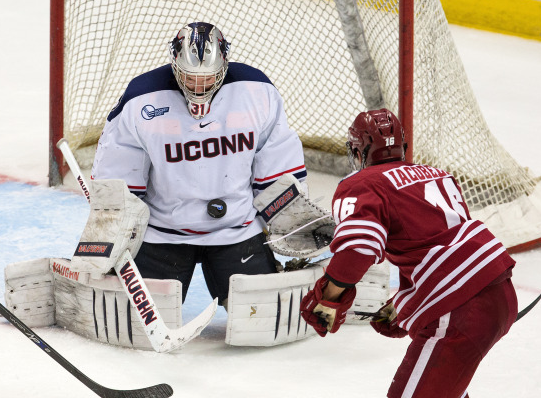 The Huskies were out-shot in the third 15-10 but out-shot UMass for the game 32-29. Four seniors registered points on the night; Ryan Tyson and Jacob Poe both got assists, Cody Sharib scored a goal, and Trevor Gerling got a goal and an assist. 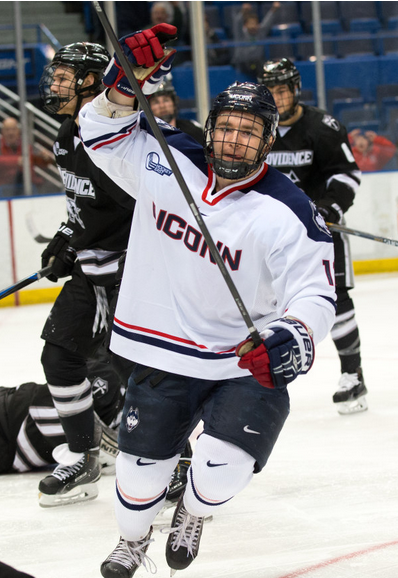 The win helped the Huskies finish their inaugural Hockey East Season with a 10-17-7 record during the regular season. The Huskies unfortunately fell short of home playoffs for the first round, finishing one spot shy, being the #9 seed, finishing ahead of Maine, Merrimack, and UMass. They would be paired with #8 seed New Hampshire Wildcats, who they had played just two weeks before, for the first round best-of-three series on the road, in Durham, New Hampshire. The Wildcats picked up where they left off from the Huskies’ last meeting with them, coming out fast and scoring just 4:38 into the game. Dan Correale sped up the left side, and fed a charging Tyler Kelleher who threw a shot on goal to which Rob Nichols made a kick-save, but the puck bounced into the air and off a UConn defenseman and in to make it 1-0 UNH. On the play, UConn got charged a penalty, giving the Wildcats the first power-play of the game. The Wildcats would convert on their chance, as Matt Willows fed the puck to Grayson Downing at the left post who buried the power-play goal to make it 2-0 UNH. UNH out-shot the Huskies 9-6 in the first period. In the second, the Wildcats’ dominance continued. The Wildcats got a five-on-three at 7:54 of the second after Spencer Naas and David Drake were whistled for back-to-back penalties. The Wildcats took the opportunity to its fullness, as Grayson Downing fed Matt Willows in front for a goal to make it 3-0 at 8:12, and just 20 seconds later, Tyler Kelleher knocked home a loose puck in front for a commanding 4-0 lead. However, shortly thereafter, the Huskies finally broke onto the scoreboard at the 13:32 mark. Spencer Naas carried the puck around the net, turned and fired a shot on goal, through a Shawn Pauly screen, off a UNH defenseman and in to cut the deficit to 4-1. The goal was his 13th of the season and first in six games. UNH out-shot the Huskies in the period 13-6. The Huskies used that goal to carry momentum into the third period and got a second goal at the 9:39 mark to give some hope of a comeback. Ryan Tyson carried the puck into the zone and threw it on goal, and Joey Ferriss was waiting at the left post to bury it to cut the deficit in half and make it 4-2. The goal was Ferriss’ second on the year. The Huskies continued pressuring but came up empty on their chances so in the final two minutes, the Huskies pulled Nichols to hope to spark another goal, but came up empty, and UNH instead tacked on an empty-net goal by Grayson Downing, at 19:15 of the period, making the final score 5-2. Nichols made 28 saves on the night; the Huskies were out-shot 11-10 in the third and 33-22 for the game. With the loss, UConn was on the verge of elimination, down 1-0 in the best-of-three series. The Huskies played game 2 of the series, looking to beat New Hampshire to stave off elimination, force a game 3 and save their season. The first period was full of scoring chances for both sides but ended scoreless. UConn’s two best scoring chances of the period were when Cody Sharib was stopped on the front doorstep in the opening minutes and Patrick Kirtland blasted a slap-shot right off the post. The Wildcats led in shots in the period 11-6. In the second, the Wildcats swung things in their favor by getting four power-plays, helping them out-shoot UConn 19-3 in the period as a result, but Nichols made all 19 saves, keeping the game scoreless going into the third period. The Wildcats almost did score then when a Brett Pesce shot rang off the post. New Hampshire continued offensive pressure in the third but Nichols still stood tall in net, stopping a Andrew Poturlaski breakaway on the doorstep and denying Tyler Kelleher on two point blank shots to still keep the game knotted at 0-0. Unfortunately though, despite Nichols’ heroics in net, the Wildcats would finally break through. Brett Pesce sent a pass to Wildcat player Jamie Hill who skated through the pair of UConn defenders coming in on a breakaway but was stopped by Nichols. The Wildcats then crashed the net and Kyle Smith knocked home the loose puck before a pile up in front knocked the net off the moorings but the goal would be reviewed and upheld, to give New Hampshire a 1-0 lead at 11:02 of the third period. The goal put some desperation into the Huskies who got some good looks but failed to score and the Wildcats would score again with 47 seconds left to make the final score 2-0 when a turnover in the UConn resulted in a goal for Grayson Downing when his shot from the left circle found the twine. The loss eliminated them from the playoffs, ending their season. New Hampshire out-shot UConn 14-10 in the third and 44-19 for the game. Nichols was incredible, stopping 42 for a career-high in saves for a game. Despite getting knocked out of the playoffs after only the first round, the Huskies had an amazing first season in Hockey East and exceeded all expectations. They finished the #9 seed when they were expected to finish dead-last, and finished the year with a 10-19-7 mark and incredibly went 7-11-4 in conference play. They played great at their new home the XL Center, having a 5-3-3 mark there, with four shutout wins coming there. Their attendance at the games was amazing, tops in Hockey East, with their highest attendance being almost 8100 (Vs. Boston College) and their smallest still being sizable at almost 3900 (Vs. RPI). 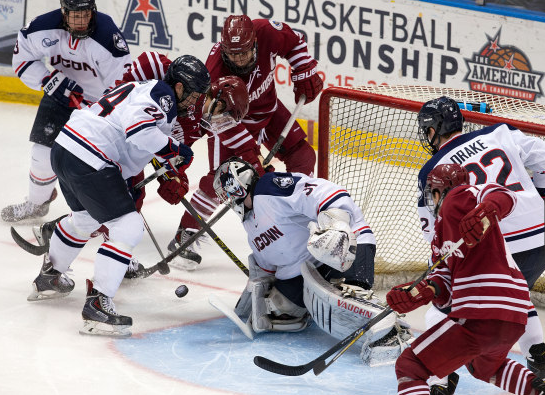 They had four wins against top-20 teams, defeated the Boston College Eagles in their first-ever meeting with them, and was the team to hand the UMass Lowell Riverhawks their first Hockey East loss of the year. With all these accomplishments just in their inaugural season in Hockey East, UConn definitely has proved they belong in Hockey East and that they have a bright future there. That was quite a nice write up you did. The pictures are priceless.